Wind Power. Renewable energy science kit. Discover how the sun makes the wind, providing us with an endless source of energy. Construct a wind turbine and conduct more than 20 hands-on experiments. Ages: 8+. Build a working wind turbine to harness power out of thin air. Wind is one of the most promising sources of clean, renewable energy available today. Wind energy has been used for centuries to pump water and crush grain in windmills, and is now increasingly being used to generate electricity to power our modern world. 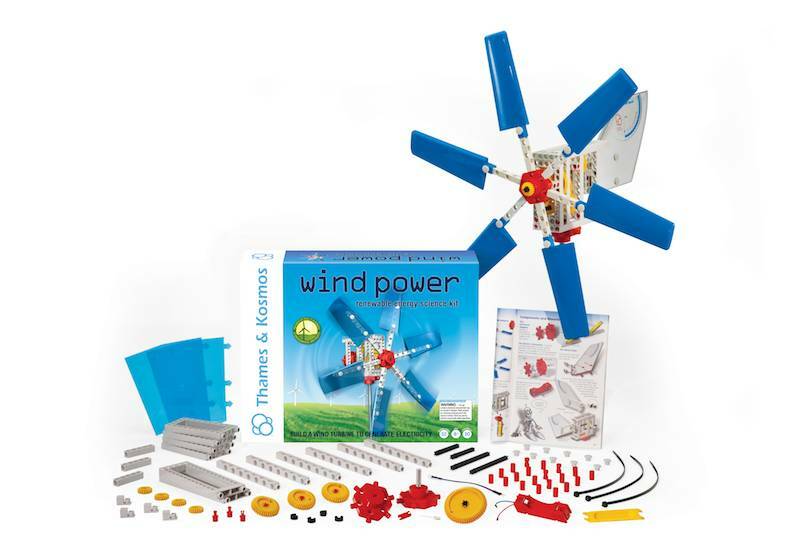 First, assemble a wind turbine complete with electric generator, adjustable rotors, and wind speed indicator. Then, conduct more than 20 experiments with your wind turbine, including experiments with different numbers of rotor blades, different blade angles and profiles, different wind speeds, different gear ratios, and so on. Use the wind turbine to generate mechanical power to lift a heavy weight or generate electricity to light up an LED and charge a rechargeable battery. During the experiments, you will learn the physics of force and motion as it applies to wind power technology. Learn how to measure and calculate the different forces acting on the rotor blades by breaking them down into vectors. Discover how the sun makes the wind, providing us with an endless source of energy. Read about different types of wind turbines and windmills. The full-color, 32-page experiment manual offers illustrated instructions and scientific information. 1% of the SRP for every Wind Power kit sold is donated to environmentally-focused non-profits in the United States.